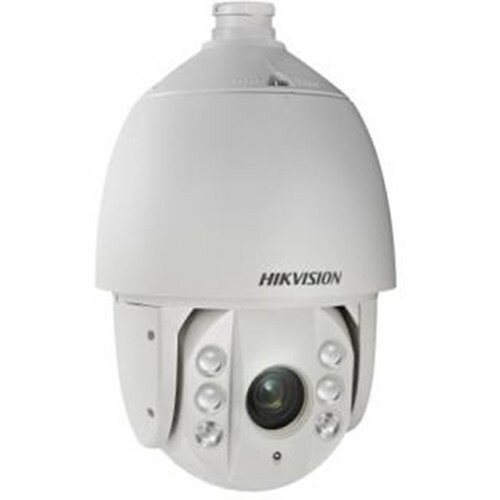 Monitor a parking lot and zoom in on distant license plates using the 700 TVL PTZ Outdoor Dome with IR LEDs Camera with IR LEDS from Hikvision. The camera features a 3.3 to 119mm varifocal lens with optical and digital zoom capabilities for keeping an eye on a large area and zeroing in on suspicious happenings. With 700 TVL resolution, as well as AGC, white balance, 3D-DNR, and true day/night, the camera offers clear pictures that aren't affected by changing light levels. Featuring up to 256 presets for pan and tilt functions, the camera can continuously rotate allowing you to scan a large area with only a single camera. Up to 8 zones per image can be masked for privacy to block areas with sensitive information or property that cannot be recorded. With an IR range of up to 328', the camera catches movement even in completely dark environments. Housed in an IP66-rated enclosure, the outdoor dome protects the lens from water, dust, and other harsh weather elements.